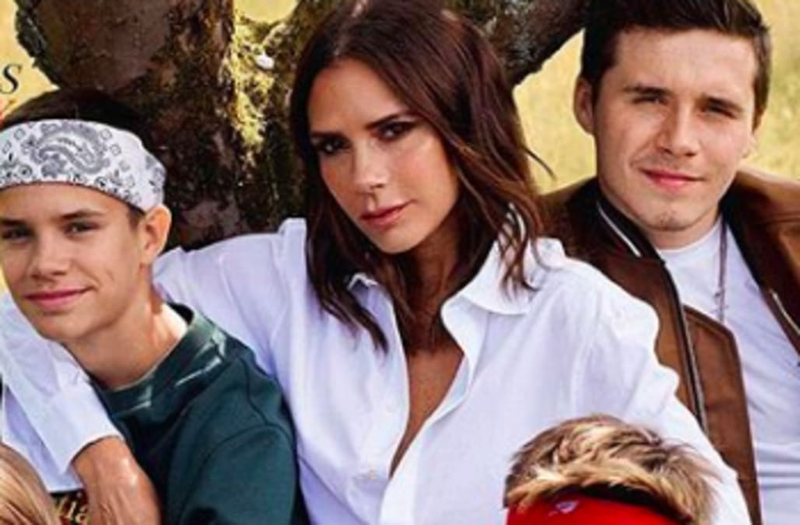 It was a family affair on Victoria Beckham’s British Vogue cover. After the 44-year-old fashion designer had some Spice Girls fun in a hilarious behind-the-scenes video in which she tried on her iconic catsuit and quoted the girl group’s lyrics, the magazine’s October cover and several of the stunning inside images were released, featured Victoria and her beautiful family. The group is all dressed in Dior, and look like the perfect models next to their famous mom. But in one of the sweet inside photos, they’re also not afraid to get dirty. In the shot, Victoria and her husband, David Beckham, are sitting on the ground while their four kids shoot each other with water guns in the grass. Sweet Harper is sporting a red dress with wet hair as she aims her gun at her eldest brother, Brooklyn. Harper also appeared in the background of a black and white cover which features Victoria and David posing on the grass together with Harper on a swing behind them.